Democratic Senator from New Jersey, Bob Menendez, has announced his candidacy for reelection and a third term in the Senate. Photo: Aaron Bernstein / Reuters. Source: The Daily Beast. 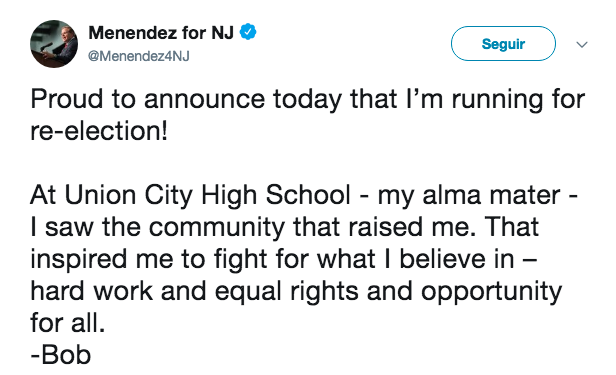 From Union City High School, and in keeping with his word, Hispanic Senator Bob Menendez has officially announced that he will participate in the midterm elections to try to re-elect himself as the representative of the State of New Jersey. Just two months after the Department of Justice gave up on the case against him, the Senator went to his former high school to speak to "more than 1,000 students – mostly, like Menendez, of Hispanic heritage," Politico reported, and to announce his campaign to stay in the Senate. The Democratic Senator seems to finally feel free of the black cloud that has haunted him in recent years in the form of a trial for eight charges of bribes, product of a two-year investigation carried out by the Department of Justice which determined that the exchange of political favors and luxury gifts between the senator and Dr. Salomón E. Melgen of Florida was irregular. After having remained solid in his declaration of innocence, Menendez has returned to the ring at a critical moment for US politics. As Politico continues, "New Jersey hasn’t elected a Republican to the U.S. Senate in 46 years," which, added to the candidate's Hispanic profile, would make a third term easier for him, but his emergence in a court could bring consequences, since he must still face an ethical investigation within the Senate. Added to this, the Senator already has opponents. The executive announced his candidacy last February and described himself as "a fiscal conservative who will work with Democrats and disagree when needed with Republicans including President Donald Trump," the report continued. Likewise, Hugin said he felt "offended by Senator Menendez’s actions” who would have "violated the public trust." And the competition didn’t take long to escalate. But the biggest battle for Menendez could be against the expert and Democratic lawyer, Michael Starr Hopkins, who introduced at the beginning of the year his candidacy for the June primaries willing to be the best Democratic option against the Hispanic Senator. "How can we run against the corruption of Donald Trump if we’re excusing corruption within our own party?" Hopkins asked on Sunday, January 28. Although nothing is written in stone, this promises to be one of the most intricate key races in this year's elections.